Welcome to the Thirty Seventh Edition of the Owen Guns Bulletin. $1300 to $1500. phone for more details phone 07 54 825070. 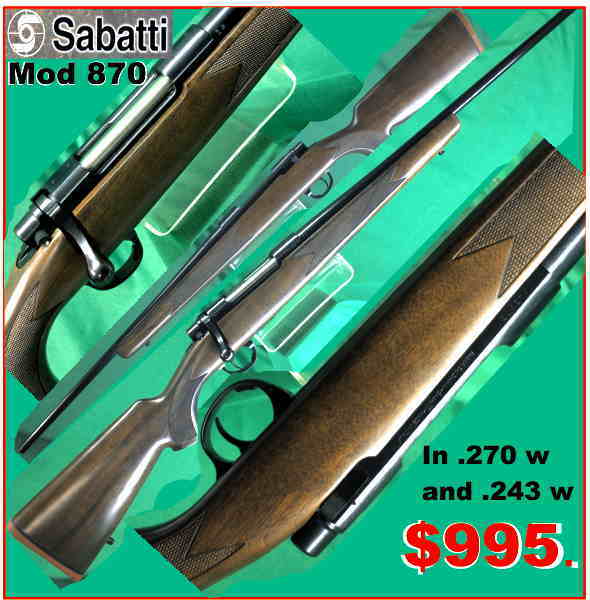 Most of the .22 caliber rimfire bolt action rifles have a slackless trigger mechanism, slackless means no fore travel or a single stage trigger instead of a double stage trigger. 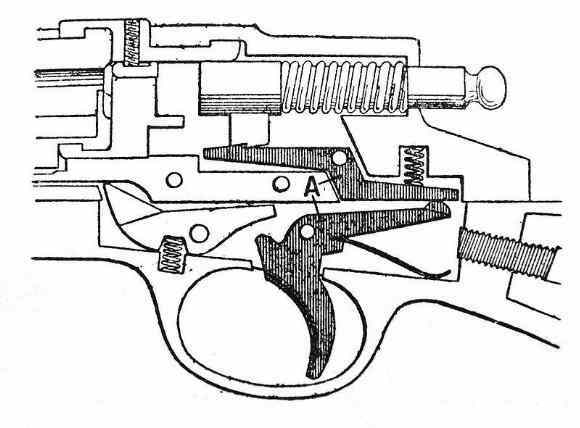 A double stage trigger, or a slack trigger mean that the shooter has to take up the slack first stage with a little pressure, until the trigger comes to bear on the second pressure which actually releases the sear and then the striker as in the stock standard 98 Mauser and the Lee Enfield Rifles. 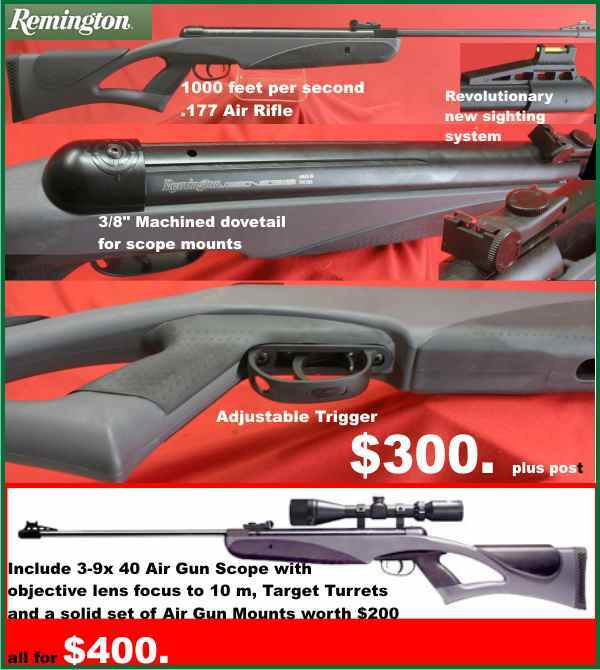 .22 cal rimfire bolt action rifles can easily be designed to have a slackless single stage trigger as there is no appreciable recoil, the action is not operated fast or hard, nor is clearance between parts required with large tolerances to operate in sand, mud or dust essential. A shotgun should always have a slackless trigger as in aerial moving target shooting there is no time to take up a slack. Most shooters prefer a trigger without backlash that is one that stops positively as soon as the sear has been released, and has no further backward movement. This has been accomplished in the case of the trigger on the Remington Model 700 bolt action rifle, and with several trigger mechanisms of private manufacture. 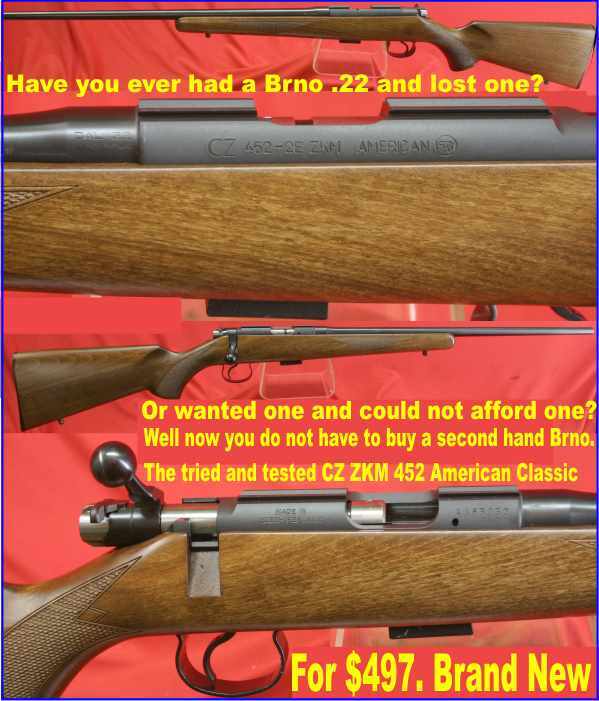 Some marksmen may derive considerable benefit from such a trigger, but it is not believed to be essential as evidenced with the very large number of good scores being turned in continually with the Brno Model 2 CZ rifles, the trigger of which does have backlash. It is well considered that a trigger with a pull under three pounds is unsafe. 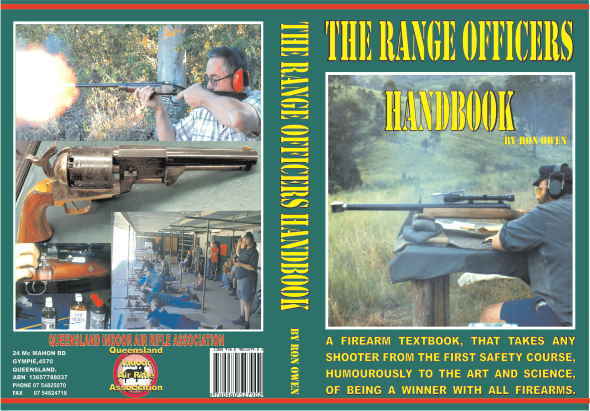 With a lighter trigger even a highly trained marksman may have a premature discharge in firing rapidly, and a cocked rifle with lighter pull could be discharged by a fall or rough handling. Riflemen, or pistol shooters who contend in certain forms of target and varmint shooting sometimes prefer a set trigger. Such a trigger ordinarily performs in the usual manner, but when “set” the weight of pull is greatly reduced, even to an ounce or a mere touch. It is not used in rapid firing, and should not be set until the shooter is all ready to fire, so that the danger of discharge from a fall is reduced. 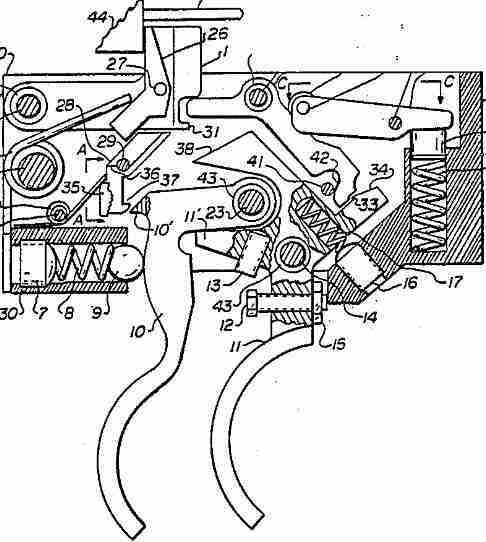 With a double set mechanism there are two triggers. 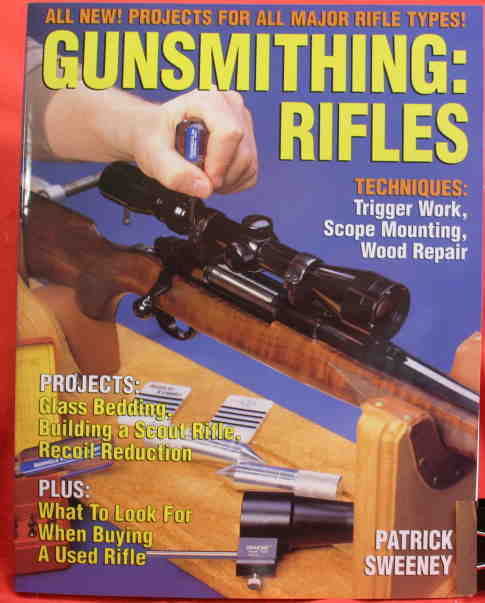 As soon as any pressure is applied to any trigger it may go off so only use a set trigger when the sights are on target and you are ready for the rifle to fire. Sometimes the front trigger operates the same as a regular trigger, but if the rear trigger is pulled back hard, first, the front trigger is thereby “set” and the pull reduced to a very light one. In other Double Set Trigger the front trigger will not fire unless the rear one is pulled first. They need a bit of getting used to and some people, who are critical have suffered a fumble experience when first used and have not had the patience to put time and thought into there use. 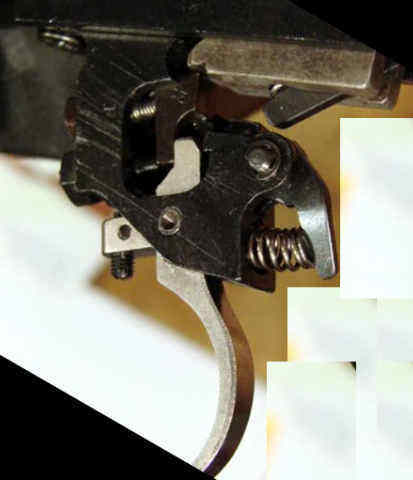 A screw, usually appearing in the trigger guard between the two triggers, serves to regulate the weight of this pull. By screwing this screw in a pull may be secured that will cause discharge when merely touching the front trigger lightly. With another form of double set trigger the rear trigger is pushed forward to set the front trigger. With a single set trigger there is but one trigger, and it is set by pushing it forward and released by applying pressure to a bar at the front of the trigger. Set triggers to some extent precludes the requirement for careful training in trigger squeeze application, as the trigger can be pressed with very minimum disturbance to the rifle which should guarantee very accurate shooting. On the other hand the user must be extremely careful to avoid premature discharges and accidents, and everyone should acknowledge that it is an impossible trigger for rapid firing. 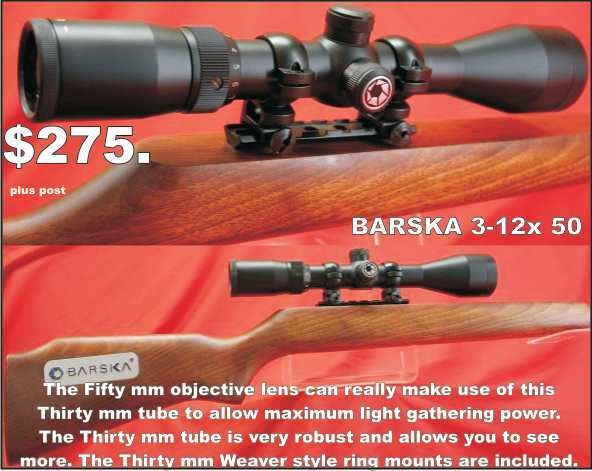 These days most set triggers are only fitted on a rifle or single shot pistol when the customer specially orders one. Edition 38 Lock Time Ignition. A Free NEW VERSION External Ballistics Calculator for all Components not Brand Specific. Click This Link to read the NEW Instruction Sheet. Email : OwenGuns@spiderweb.com.au and the NEW IMPROVED External Ballistics Calculator program will be sent to you in EXCELL Format free of charge. Smokeless Powder. Where does it Come From? The Australian handloader has always had to battle acquiring a good supply of powders. Once he finds a favourite load he often goes to his local gun shop and finds that the importer is not bringing that brand in any more, or that the freight company that dispatched it for twenty years has now found out its dangerous goods so will not move it any more and another company has to be found, or its simply run out, as we have massive amounts of anti terrorism laws the wholesaler has given up due to the bureaucratic nightmare that his staff have to carry out free so the government can charge him for doing it. So, I would not be advising people to store life time supply but if you have a brand and type you like using I would keep a tin or two in advance. In Australia we have one domestic manufacturers ADI, or Mulwex or what ever name they are using for marketing now, and Hercules/Alliant and Winchester are imported, Hodgdon’s are sold in the USA but are not sold in Australia even though they are made by ADI in Mulwala Victoria. 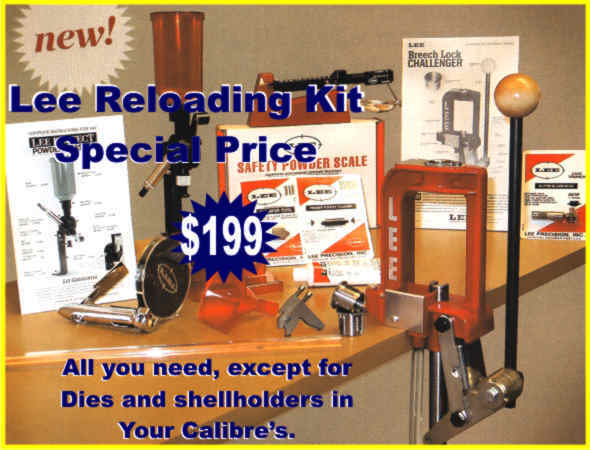 Naturally, all of the firms just mentioned compete with each other for the reloading market and this has eventually resulted in better products. We classify all small arms propellant powders in two groups: “straight” nitrocellulose, single base, and those containing also a substantial percentage of nitroglycerine, double base. For many years the basic formula for smokeless powder has changed very little. As a fuel, which it is, in reality, common garden variety smokeless powder is pretty efficient. In the firearm (essentially a single-cylinder internal combustion engine) it is considerably more efficient than petrol in your car engine. (Probably nearly double the efficiency, that’s why your car will only go at 150 miles and hour and bullets go further, faster and use less of it. Of course your car is a guided missile and has far more kinetic energy.) So please don’t knock it simply because it is made from basic a100 year old formula. While it may be possible for future small arms propellants to come along as a result of the vast amount of rocket propellant research into hydrogen, you can plan on using the current crop for many years to come. 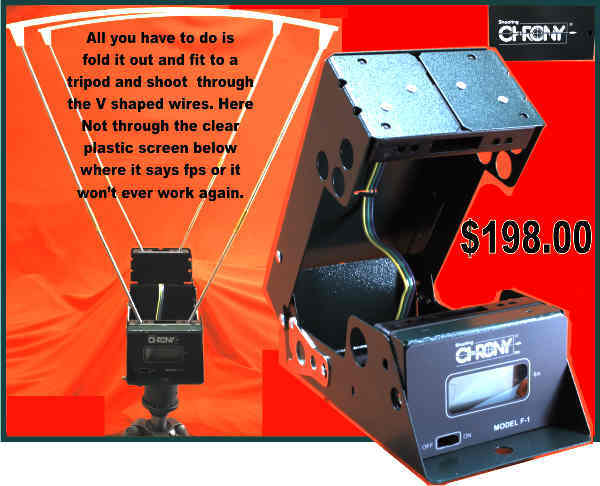 On the other hand, manufacturing methods have undergone a great deal of change over the years. These changes have resulted primarily in greater stability (freedom from deterioration due to age or climactic conditions) and uniformity and reduced production costs. Acids are extremely vital to powder manufacture, yet, are conversely powder’s greatest enemy. Unless all traces of acids are removed in the final stages of manufacture, powder deteriorates rather rapidly with age. During the early 1920’s, millions of pounds of powder left over from World War I had to be destroyed because it deteriorated in storage magazines. Other large quantities destroyed themselves simply by spontaneous fire. These incidents were brought about directly or indirectly by residual acids which emergency, wartime production methods failed to remove. In addition to the vast quantities of bulk powder destroyed due to deterioration, much loaded ammunition was destined for the same fate. During the years following the two Great Wars, Ordnance inspectors tested samples of all lots of military ammunition in storage at frequent intervals. When deterioration was discovered, the ammunition was condemned and often effectively destroyed by dumping it in deep water at sea. It was also sometimes destroyed by burning, but that is a slow, laborious and expensive way to do the job. I have had satisfactory results from fifty year old powder and found some at barely ten years old that had orange globules in it and some others that had broken down into liquid lumps. Don’t use it like that. With such problems in the background, the military establishment was greatly interested in a product better suited to storage. DuPont and Hercules the primary WWI powder producers, developed and perfected new production methods before WWII thundered into being. The War Department’s Picatinny Arsenal also conducted considerable research into better methods. Fortunately, these efforts set the stage for WWII powder production in quantities that staggers the imagination, yet today, much powder produced during the painful early 1940’s is still perfectly safe and usable. Magazines fires and explosions like those of the 1920’s are not unknown, but are rare. Naturally, production facilities were not adequate to the task at the start of WWII. The quantities produced aren’t important for our purposes here. It is sufficient to say that in the peak year (1943) of U.S. small arms ammunition production, the entire U.S. powder production of WWI could have been matched in slightly over one week! One plant produced 206,700,000, (yes that is 26 million a month) rounds of .30/06 ammunition per month at its peak rate. This required 1,476,430 pounds of IMR 4895 powder, one full freight car (50,000 lbs.) , each day. Another plant (the smallest in operation) produced 1,200,000 calibre .50 M.G. cartridges daily. This consumed nearly 43,000 lbs. of powder each day. And, it was the smallest in operation. Since the WWII production methods were eminently successful and are still in general use, we’ll describe them in some detail, digressing only where significant changes have taken place. For convenience sake, we’ll break production into two stages —that of processing the nitrocellulose, and that of converting the nitrocellulose to powder. High grade nitrocellulose (actually cellulose-nitrate) is required for all powders, so up to the point of delivery of the nitrocellulose to the powder mill, processes are the same. The Liberal Member of Federal parliament Joe Hockey has still not responded in any way the letter I emailed to him, has any one else had a response at all from the man who has supposedly seen the light and made the speech, IN DEFENCE OF LIBERTY or is he just another political hypocrite? A humorous article that should be read by every RSPCA member, or any other of those Walt Disney World animal huggers. Lets hope they all take a play with Bambi one day. I'm not really a Red Deer, I have just had a bath and I'm still trying to lick his blood off. Yuk humans taste so gamey, I wonder if they are better hung? “I had this idea that I was going to rope a deer, put it in a stall, feed it up on corn for a couple of weeks, then kill it and eat it. The first step in this adventure was getting a deer. I figured that, since they congregate at my cattle feeder and do not seem to have much fear of me when we are there (a bold one will sometimes come right up and sniff at the bags of feed while I am in the back of the truck just a few feet away), it should not be difficult to rope one, get up to it and toss a bag over its head (to calm it down) then hog tie it and transport it home. I filled the cattle feeder then hid down at the back end with my rope. The cattle, having seen the rope trick before, stayed well back. They were not having any of it for a while. After about 20 minutes, my deer showed up, 3 of them. I picked out a likely looking one, stepped out from the end of the feeder, and threw my rope. I took a step towards it. It took a step away. I put a little tension on the rope and then received an education. The second thing I learned is that pound for pound, a deer is a LOT stronger than a cow or a horse. A cow or a horse in that weight range I could fight down with a rope and with some dignity. That thing ran and bucked and twisted and pulled. There was no controlling it and certainly no getting close to it. As it jerked me off my feet and started dragging me across the ground, it occurred to me that having a deer on a rope was not nearly as good an idea as I had originally imagined. The only up side is that they do not have as much stamina as many other animals. I thought if I just let it go with the rope hanging around its neck, it would likely die slow and painfully somewhere. At the time, there was no love at all between me and that deer. At that moment, I hated the thing, and I would venture a guess that the feeling was mutual. Despite the gash in my head and the several large knots where I had cleverly arrested the deer’s momentum by bracing my head against various large rocks as it dragged me across the ground, I could still think clearly enough to recognize that there was a small chance that I shared some tiny amount of responsibility for the situation we were in, so I didn’t want the deer to have to suffer a slow death, so I managed to get it lined back up in between my truck and the feeder, a little trap I had set before hand…kind of like a squeeze chute. I got it to back in there and I started moving up so I could get my rope back. Now, when a deer bites you, it is not like being bit by a horse where they just bite you and then let go. A deer bites you and shakes its head, almost like a mad dog. (bull terrier, or shark like) They bite HARD and it hurts. I, being smarter than a deer (though you may be questioning that claim by now), tricked it. While I kept it busy tearing the tendons out of my right arm, I reached up with my left hand and pulled that rope loose. That was when I got my final lesson in deer behaviour for the day.. Deer will strike at you with their front feet. They rear right up on their back feet and strike right about head and shoulder level, and their hooves are surprisingly sharp. I learned a long time ago that, when an animal, like a horse, strikes at you with their hooves and you can’t get away easily, the best thing to do is try to make a loud noise and make an aggressive move towards the animal. This will usually cause them to back down a bit so you can escape. This was not a horse. This deer had not been to horse school. 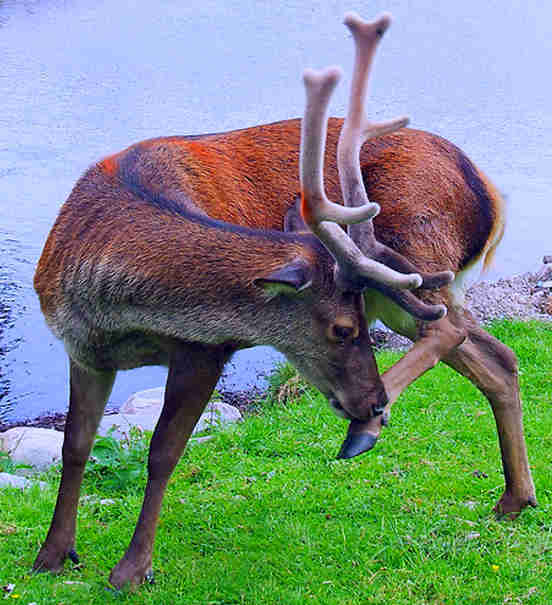 This was a deer, so obviously, such trickery would not work. In the course of a millisecond, I devised a different strategy. Now, when a deer paws at you and knocks you down, it does not immediately leave. It impales you and rolls you along the ground with its antlers. I suspect it does not recognize that the danger has passed. When it gets tired of that, it takes a break for a change it paws your back with its hooves and jump up and down on you while you are laying there crying like a little girl and covering your head. I finally managed to crawl under the truck and the deer went away. A few days later after I got out of hospital, I found the rope and its condition was as damaged as mine. So now I know why when people go deer hunting they bring a rifle with a scope to sort of even the odds out a bit. If he wakes, his worst Nightmare could be very close. From Free Russia with Love ! The irony of this following article appearing in the English edition of Pravda (Russian on-line newspaper) defies description. Why can a Russian newspaper print the following yet the American (and Australian) media can’t or won ‘ t see it? First, the population was dumbed down through a politicized and substandard education system based on pop culture, rather than the classics. Americans know more about their favourite TV dramas than the drama in DC that directly affects their lives. They care more for their “right” to choke down a Mc Donalds burger or a Burger King burger than for their constitutional rights. Then they turn around and lecture us about our rights and about our “democracy”. Pride blinds the foolish. Then their faith in God was destroyed, until their churches, all tens of thousands of different “branches and denominations” were for the most part little more than Sunday circuses and their televangelists and top protestant mega preachers were more than happy to sell out their souls and flocks to be on the “winning” side of one pseudo-Marxist politician or another. Their flocks may complain, but when explained that they would be on the “winning” side, their flocks were ever so quick to reject Christ in hopes for earthly power. Even our Holy Orthodox churches are scandalously liberalized in America . The final collapse has come with the election of Barack Obama. His speed in the past three months has been truly impressive. His spending and money printing has been a record setting, not just in America ‘ s short history but in the world. If this keeps up for more than another year, and there is no sign that it will not, America at best will resemble the Weimar Republic and at worst Zimbabwe . 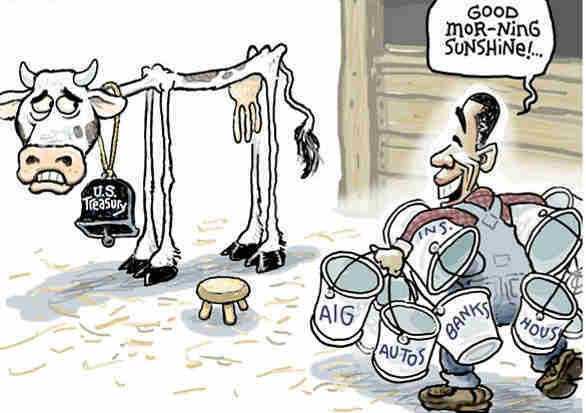 Then came Barack Obama ‘ s command that GM ‘ s (General Motors) president step down from leadership of his company. That is correct, dear reader, in the land of “pure” free markets, the American president now has the power, the self-given power, to fire CEOs and we can assume other employees of private companies, at will. Come hither, go dither, the centurion commands his minions. So it should be no surprise, that the American president has followed this up with a “bold” move of declaring that he and another group of unelected, chosen stooges will now redesign the entire automotive industry and will even be the guarantee of automobile policies.. I am sure that if given the chance, they would happily try and redesign it for the whole of the world, too. Prime Minister Putin, less than two months ago, warned Obama and UK ‘ s Blair, not to follow the path to Marxism, it only leads to disaster. Apparently, even though we suffered 70 years of this Western sponsored horror show, we know nothing, as foolish, drunken Russians, so let our “wise” Anglo-Saxon fools find out the folly of their own pride. Again, the American public has taken this with barely a whimper…but a “free man” whimper…? So, should it be any surprise to discover that the Democratically controlled Congress of America is working on passing a new regulation that would give the American Treasury department the power to set “fair” maximum salaries, evaluate performance, and control how private companies give out pay raises and bonuses? Senator Barney Frank, a social pervert basking in his homosexuality (of course, amongst the modern, enlightened American societal norm, as well as that of the general West, homosexuality is not only, not a looked – down upon life choice, but is often praised as a virtue) and his Marxist enlightenment, has led this effort. He stresses that this only affects companies that receive government monies, but it is retroactive and taken to a logical extreme, this would include any company or industry that has ever received a tax break or incentive. Would any of us have believed in the 1980s that this would be printed in Pravda in 2010? With the proud Americans will go the Australians, Brits, Canadians, New Zealanders, as the Americans are not on their own, We are all, by our silence condemned. The Sabattis come with open sights, and sling swivels (not shown), they are drilled and tapped to suit Weaver bases and rings (not included). 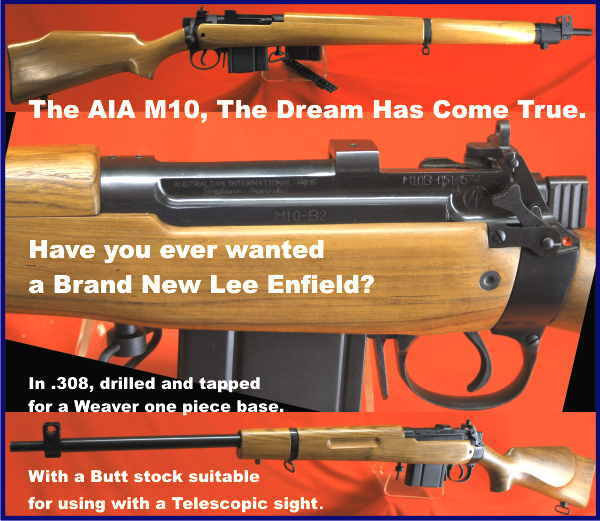 They have a solid action with front double locking lugs and have a drop down floor plate magazine similar to Remington BDL and Parker-Hale Deluxe. For the quality of the wood and finish on the steel work they are a steal at. Operational manual translated from the 1977 Swedish Army Manual specifications.technical details, Ammunition, Function,Zeroing, Maintenance Night vision sights. Details on snipers scope. With Assemble and Diss-assemble methods.